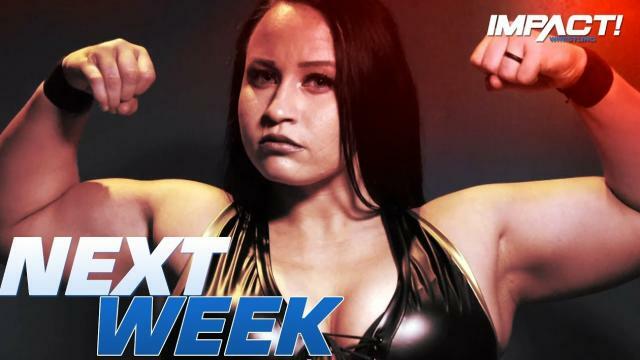 This Thursday, Jordynne Grace makes her debut at Impact Wrestling on Final Hour as the newest Knockout. Grace talked with Fightful's Kristen Ashly about her thoughts on women's wrestling, creepy DMs, and her hopes for the future. Though most remember Grace as the breakout star from All In, who eliminated Brian Cage in a no. 1 contender "Over Budget" Battle Royal for the Ring of Honor World Title, Grace is an eight-year veteran who started wrestling at the young age of 14. Grace touched on what it was like wrestling at such a young age. "Women’s wrestling was a different landscape when I first started. In a way, I grew up with the women’s revolution, and we hit our peaks at around the same time. The [last] couple of years the women’s revolution has picked up speed, as have I. When I first started, women’s matches weren’t looked at as much more than a necessary evil, as male fans wanted eye candy, and promoters knew they had to supply it. Especially in the Texas area where I grew up in. Texas seems to always have been slow in catching up with the times." A few years later, at 17 years old, Grace participated in Lucha Libre Femenil in Mexico. The experience changed her wrestling style, and outlook on the industry. "Looking back on my experience, it definitely made me tougher. Mexico was where I feel I “paid my dues” the most. My 19th birthday was spent on a 12-hour bus ride to Guadalajara. Every match I did took a toll on me physically and mentally. It impacted my style by teaching me to be aggressive and hard hitting, at least making the strikes look more legitimate. Honestly, it most taught me how to PROTECT myself. When I was there wrestling at least, the women don’t get paid much, if at all, and the wrestling is just brutal. It was never my piece of cake, but my time there sure did teach me a lot," said Grace. With eight years of experience under her belt, Grace has fought a lot of tough competitors. She was asked which wrestler was her favorite to compete against. "I’ve never been one for choosing favorites," she said. "There are many wrestlers I’ve liked to work with for various reasons. People I get along with and are easiest to call matches with are my favorite, even if they aren’t the “best”. I’d rather have a three-star match with a friend than a five-star match than someone inherently difficult to work with. Some of the most talented people I’ve ever wrestled have been my least favorite experiences, solely because it was difficult to plan the actual match. At the top of my list of people to wrestle are, in no particular order: Deonna, Allie Kat, Kylie Rae, Maria Manic, Ethan Page, Skylar, Tessa." Grace's most recently memorable moment in wrestling, is when she eliminated Brian Cage from the "Over Budget" Battle Royal for the ROH World Title at All In. She spoke on what the moment felt like, for her. "It felt like all my hard work and suffering over the years finally paid off," Grace said. "I essentially gave up a good portion of my childhood for wrestling, and that moment made it all very worth it. Men are naturally heavy handed. Women are typically not. Intergender matches are more physically demanding most of the time. It’s not a bad thing, just a fact. I’m sure most other female wrestler’s would agree." Earlier this year, Grace took the women's revolution a step forward, and took body shamers and perverts to the publishers by releasing "DMs of a Female Indy Wrestler", a 28-page book filled with gross and inappropriate DMs she's received on Twitter from various followers. Grace was asked how the DMs have impacted her wrestling, what she's done in response, and her advice for other women who experience the same issue. "I haven’t done anything to prevent the DMs. I shouldn’t have to, and I won’t. Women shouldn’t have to stop wearing certain types of clothing in order to prevent harassment, and I certainly won’t be closing my DMs for the same reason. For every message that makes me shake my head in disgust or roll my eyes, I get another uplifting, positive message about someone loving my work or thinks I’m inspirational. I love to interact with actual fans, and I have no intentions of ever turning off my DMs to placate some notion that I should if I don’t want to be harassed. To the women experiencing this type of harassment, you have several options. One: block the person. Two: when possible, find the perpetrator’s wife/mother, screenshot and send them their harassing messages. Three: publicaly post a screenshot of their message. Four: troll them. (See "DMs of a Female Indy Wrestler: Volume 1", page 24/25 for guidance.) Five: ignore them. There’s many different ways to handle this sort of harassment, and no need to feel like a victim. Just know you are far from being alone," Grace told us. Finally, Grace was asked if she would ever participate in the Mae Young Classic, and what her future plans include. "Of course, but it seems to not be in the cards for me for at least the next couple of years. My words to women out there everywhere, are keep following your dreams. If you’re already living your dream, don’t lose sight of the importance of maintaining family, friendships, and your own mental/physical health. Be safe and stay strong," she closed. It was recently revealed that Grace might not have to wait until February for new booking opportunities. After consulting with my doctor this morning, I’ll be available for new bookings again starting January 2019. In the meantime, catch me on @IMPACTWRESTLING, @ThisIs_Progress, @PCW_UK, & @ProWrestlingEVE! Tune in to PopTV on Thursday, Nov. 8 at 10 p.m. EST to see Jordynne Grace's debut on Impact: Final Hour. Women's Wrestling Podcast (2/23) | The Division From Fightful | Chyna, Tag Titles, More!